The final AP and Coaches Polls are out. 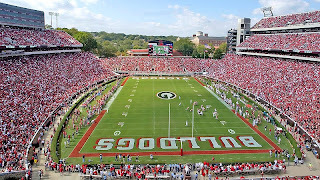 -- Coaches: Georgia = Unranked. Speaking of season ending recaps. How about the finals for how the ACC and SEC stack up in the final polls, and let's look at the Bowl results for the various leagues. I wish I could photoshop this to say "overrated"
As far as the game went last night I really appreciate the SEC boost we got last night, yes I hate UF, UT, AU, and GT. There is one thing I have to say. Did you see the script OHIO last night I was pretty cool. It was my first time seeing it. I honestly appreciated the fan loyalty of tOSU fans because at the end of the script they honestly blew away anything I have ever heard. I could hear through the TV almost all of the their alma mater. I was amazed at the spirit and fire that was seeming lost on the players. To the real point. I was at the Chic-Fil-A bowl section 313, row 1 seat 11. I was standing up shouting for the D and all of the sudden a penny hits me in the head. I turn around and an UGA fan, the one that threw the penny, along with the 15 rows behind me were sitting down. This man who threw the penny had the audacity to tell me to sit down. I could not believe it. I want to make this comparison between tOSU and UGA fans simply because we were down 14-3 at the time I was struck and our fans who wear the red and black are sitting on their hands. We must realize that they need to get up. I only get to go to 1 game a year because of my profession so it really irks me when our fans claim to be loyal but crap out when the going gets tough. I realize that the tOSU fans were sitting down as they got throttled last night but the fact that they had more energy for their band and tradition than we have for the UGA football team who is down 14-3 is ridiculous. Sorry for this but I has really been on my mind and I wanted to share this experience and hope that UGA fans will learn from tOSU and my experience that it takes ALL of us to motivate our team. Thanks. P.S. I know that you have discussed this before but I wanted to vent. I can't believe UGA didn't make the cut in the coaches. Did any of the teams in the Top 25 lose to Vanderbilt? That must be the reason. Hrm, did any of the teams in the top 25 also beat Auburn, Yech, and VT in successive weeks? Yeah, I thought not. Florida has the most dominant athletic program in the country. National Champs in basketball--turn around the next year and win it all in football. And LSU is second. Final Four in bball, followed by a number 3 ranking in football. And then, on the other end of the spectrum, you've got Georgia. . . .